Hostage is now finished! Also working on a couple of crime novels; not sure if I'm Away good at it yet! Working on a novella called, Hostage aimed at young adults. Don't want to say much more until I've finished the first draft. Started work on a fable I worked on some time back. The Water thief is about how a community has it's well Stolen and closed and loses access to fresh water. The main character, Maria, is the daughter of a fisherman and a manatee, and with help from her parents is able to save the Community. Looks Like it will be published in 2017/18. Watch this space. November 2015: leave Manitoba in a few days, after a memorable vist to Churchill (see blog). Writing has gone well. September 2015: Sorry for the gap in this journal but my aged computer could not access it to edit! January 2015: The Crime novel is ongoing. December 2014: Still on the crime novel. November 2014: Still working on the crime novel. October 2014: Working on crime novel. August 2014: My new novel is now with my agent...the waiting begins. New story, PELT, just published online at Holdfast Magazine. April 2014 : Finished revising my first novel, Marge , now called, IDENTITY it will be on sale soon, will paste a link when ready. 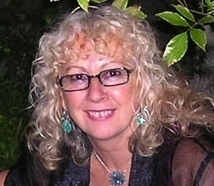 March 2014 Avril Joy - winner of the Costa Short Story award in 2014 - has just published a kindle version of her new book on writing: From Writing with Love. I think you will find it inspiring. paperback edition coming soon. January 2014: Pleased to hear that Holdfast Magazine have accepted my short story, Pelt, for publication. Will put a link on here when It's ready. Also heard that in 2015 I'm being awarded a short residency at the Heinrich Boll cottage on Achill Island, Ireland. January 2014: Now working on Identity, which is a new edit of my first novel, Marge which was published in the eighties and caused quite a stir. It was marketed by Sheba, the publishers, as a feminist thriller and there weren't many of those around. The subject matter is as relevant today as it was then. December 2013: having a break. November 2013...yes, still writing...commended in 2013 Portico Poetry Prize and went up to Manchester to the celebration event at the Library. Great place and interesting evening with lovely food. Nice to be featured in a poetry anthology. Busy on the next draft of a new novel, working title: Lois Baxter is Missing. Aching back and neck, doing daily walks/cycle rides and regular yoga but I think it's just the stress always associated with writing. More reviews of Miranda's Shadow on my Home page. Electronic links to Miranda's Shadow & ROOT on Publications page. Peter Mortimer and I did an event at Berwick Library on October 9th at 5.30 - 6.30pm. readings from Miranda's Shadow by me and Peter talked about what he looks for as an editor of and independent press. read at Tyneside Irish Festival in Newcastle upon Tyne October 17th 7pm. The Creels played two sets. the Irish Centre, Gallowgate, Newcastle. The event at Newcastle University went very well and lots of books were sold. Messages seem to be getting through all right now. New reviews of Miranda's Shadow on Home Page! Been busy with the new novel. Have to have a good draft to my agent by Sept 9th...help!! Had emails from a Brazilian Theatre Company and an Argentinian Film Producer. interested in rights for Pigtopia. Very exciting, seen some of the director's earlier films and we appear to have very common interests. More as I hear. Sad news: my lovely dog, Kingston died, buried at sea. Important: just discovered that messages left on this site have not been getting through because my service provider is blocking them. Trying to sort this out and apologies to everyone who hasn't had a reply. I will get round to all of you, I promise. June 24th: Back from visiting family in Lancaster and a wedding reception near Barnsley and trying to get my brain to focus but looking forward to the official launch of Miranda's Shadow on Thursday. Also - via a friend - found out there's a USA novel with the same name as my collection! Hope we don't confuse readers too much. Going out with the dog to get some sea air so that I can come back and get to grips with my novel. June 13th: Got my first review of Miranda's Shadow on View from Here website, Link on my Home Page. Pretty good review but the reviewer thought I'd let my moral code slip into view! Oh that censor on my left shoulder. I can never totally get rid of it. However it's a very positive review and I'm delighted. June 10th: pleased to have got an article on the View from Here website, all about my experience of editing. Link on my Home Page. May 20th 2013: The IRON AGE Festival, MAY 15-17, in Cullercoats, North Tyneside was a huge success. David Turnbull has done a whole album of photos. See pics at this link: https://www.facebook.com/ironfestival/photos_streamor visit the IRON Press Facebook and also Amina Matrix Evans has done a whole bunch of photos, same links. All the events were full, the readings and music were fantastic. The pairing of David Almond - reading from his new IRON Press short story collection, Nesting - with Bridie Jackson & The Arbour was inspired. Melvyn Bragg was charming and spoke very highly of Peter Mortimer, founder & Editor of IRON Press. Sean O'Brien and Melvyn Bragg gave impressive readings from Voices of Conscience, poetry by writers, imprisoned, tortured or killed because of their work. S.J. Litherland - having been in Russia at the time, with Peter Mortimer - gave a marvellous introduction to The Poetry of Perestroika and the wonderful actor, Charlie Hardwick's readings from the book were excellent and moving. But this wasn't just a festival of big names, there were loads of events: play readings from Live Theatre, Haiku, Humorous Verse, Poets from the North East introduced by the lovely, talented Kate Fox, runners ran along the coast with poet Andy Croft, first writer in residence with the Great North Run and he then read from his long narrative poem, Great North. I won't go on...but all of the readers at the festival had some connection with IRON Press and my daughter, Jo got knocked out of the Snooker Challenge, which was won by Dennis Dillon! My reading from Miranda's Shadow (my debut short story collection) on the Saturday, was to a packed audience and dozens of books were sold. 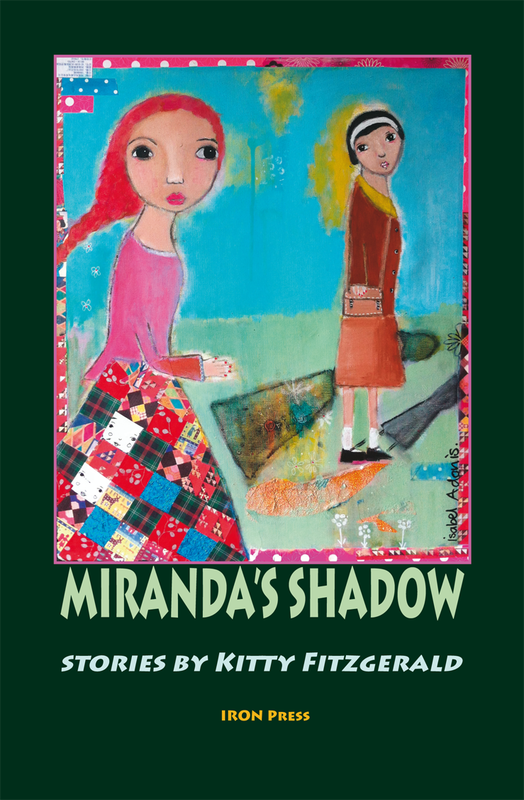 March 2013: I have now edited all the stories in my collection, Miranda's Shadow, which will be launched on June 3rd 2013. See cover image below. But I will be reading from it at the IRON Age festival in Cullercoats, Northumberland, May 15th -19th. 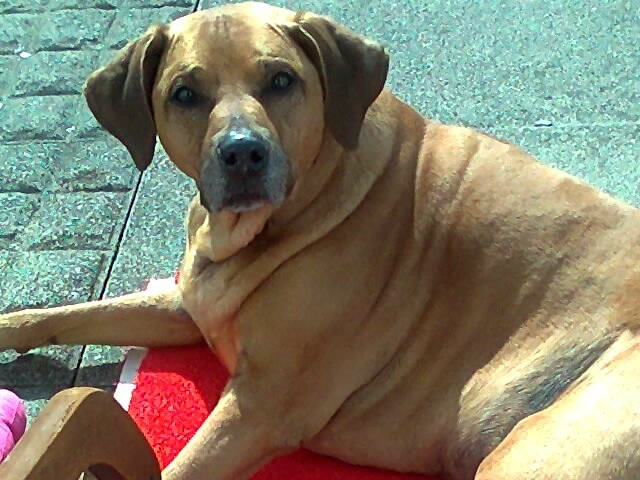 Kingston my elderly Rhodesian Ridgeback who keeps me sane while I'm writing. March 2013: See above, the cover image of my collection of short stories. The painting is by the artist Isabel Adonis. March 2013: Now had three launch events for the ROOT anthology and received some good feedback. This week it's the Newcastle launch see: http://www.ironpress.co.uk for details of all launches still to come. Great Xmas up near Lancaster with my daughter, her partner and my granddaughter, aged nine who is a sheer delight to be around. December 2012: Back in Northumberland and catching up with everyone. November 2012: Nearing the end of my residency at Hosking Houses cottage near Stratford-upon-Avon. My short story collection has been completed and will be published by IRON Press in June 2013. Hooray! I have also been working on other things and have written a new children's fable: The Water Thief, which Peter Mortimer wants to adapt as a play with Shatila Theatre Trust, for Palestinian refugees to perform in Beirut and in the UK in the near future. August 2012: great news, I have been given a Hosking Houses Trust Award to allow me to complete my short story collection. It will also be good because my mother just died after ten years of Alzheimer's disease and I will be alone - with my dog (see above) - to quietly grieve. August 2012: working on a new collection of my own short stories, Miranda's Shadow, to be published by IRON press in 2013. The title story was commissioned by New Writing North for their Platform anthology. July 2012: the stories for the new IRON Press anthology have now been selected. It will be called, Root and will be published early in 2013. I have done a rewrite of my first novel, Marge, now called Identities. I was shocked to discover that not much has changed in the world of child sexual abuse since I wrote MARGE so it is still as relevant today. November 2011 - IRON Press has asked me edit another anthology of short stories for them: it is for writers based in North East England and is planned for publication in early 2013. It's a damn strange world at the moment; it feels as if the planet is heading for major disasters because GREED has been allowed and encouraged. Do Cameron and Osborne live in a millionaire's bubble where they are totally unaware of what's happening in the world outside Westminster or don't they care? For me, working on the first draft of a new novel is a form of self-torture; the pleasure comes later on in the editing process. But I still consider myself lucky to have found a working life that fulfills me. Part of the joy is when the characters start interfering. Some just want bigger parts but the strong ones want to challenge the direction I'm taking them in, or the quality of their back story. Then it's time to listen and give them space to grow. Still doing research on the Beowulf Project. Peter and I went out to North Northumberland to see one of the Anglo Saxon Hill forts. Very high and wonderful panoramic view and also the remains of a Pink Palace. Been sitting in my partner's back yard having breakfast in the sun and watching a spider weave a line from the shed to the washing line to the window and then set about creating a gorgeous large web, so perfect, so light, so clever. Put me in my place in the scheme of things. Yesterday, went to see Anne Orwin's Senior Youth Theatre perform a short play of mine - Making Plans for Jessica. It's set in a Care Home where the residents collaborate and rebel against the senior Care Worker. The strap line is: Old Dogs; New Tricks. It's had two good earlier productions. This one was BRILLIANT because the young actors performed it so convincingly; and the direction was excellent. It needs to be seen more widely and we are making plans...Fantastic Youth Theatre Group, so talented. Working on short stories at the moment. It's a very different discipline to the novel in many ways, but at least I don't have to hold 70,000 words in my head all the time! I was stimulated by winning the Notes from the Underground/Latitude Festval Short Story Competition last year. Most excitingly. June 2010 - Ended up having pleurisy - awful pain! Back with a vengeance now. Mar.2010 - My grandson, Jack's 21st birthday. Hope he's having fun with his pals. Woke up in the early hours from a bizarre apocalyptic dream. Lots of flooding, running around large cargo boats, being chased (of course) and ending up in the sea close by some disintegrating piers. All around me in the water were dozens of wrapped presents. Wrote it all down in my dream notebook. Sometimes I look back at descriptions of dreams I've had months and years ago and I don't recognise a thing, which is really spooky. On to the hard slog with The Other Side of Clouds, a brand new ending. It's getting there. Feb .27. 2010 - Been laid up with a strange 'something'. Swollen throat, swollen tongue, back pain, loss of appetite, and that's just the start! Was supposed to be doing a reading with my partner on Wednesday evening; he was more than able to hold the fort. In bed for three days and having emerged got that brand new feeling. Also, that glad to be among the living rush. Consequently back to the work in progress, The Other Side of Clouds, with renewed energy. Should finish this draft by the end of next week. Then I'll put it to bed for a few days before doing one more draft. Just (before the compulsory bed rest) completed a picture story book for younger kids. Have to ask my friend, Maxine, down the road if she'd like to do some paintings on spec then I'll send the lot to my agent. Jan 2010 - Now tutoring part-time in Creative Writing at Northumberland University. Loving the students and their freshness; it's good to be challenged by their questions and exciting to be stimulated by their energy. Still working on my novel, The Other Side of Clouds, doing another edit and hope to complete it by mid February at the latest. Loved the snow; it was beautiful to look at and it kept me indoors, writing.